In 1923, Ray Elliott was a caddie at the Laconia Country Club in central New Hampshire. He came from a poor family, but found himself drawn to the game of golf. Elliott didn’t have money for clubs, but the players he caddied for did. In those days, of course, golfers played hickory-shafted clubs, and whether they fell out of favor for their less-than-inspired play or because they were so worn, many of Laconia’s regulars would eventually toss those old hickories in a scrap heap of sorts. They had a name for the abandoned brassies and niblicks: Throwaways. Ray Elliott lived for those throwaways. Elliott collected clubs when he could, and started playing golf at 9 years old. Eventually he completed a set in only the most basic sense of the word – no two clubs in Ray Elliott’s bag matched. Yet by 15, Elliott was a scratch golfer. He played into his 70s, spending much of that time better than scratch as a plus-player, and handed down not only his name to his son, but the love of golf. Ray Elliott, now 67 and a member of Pinehurst Country Club, shares something else with his dad – an affinity for hickory clubs. The younger Elliott also doesn’t have quite a matching set still, but that’s because two of his hickory clubs were once his father’s. Even his dad’s old putter, a 1950s-era Bristol Dandy with a copper shaft, is always in Elliott’s bag. Every time Ray Elliott plays golf, he carries his dad with him. Ray Elliott, with his father’s niblick on the 3rd hole of The Cradle. And so the Elliott’s were together, as they always are, on Pinehurst’s short course, The Cradle, on Monday. And whenever Elliott plays The Cradle, he always uses his hickories, including one of his dad’s original throwaways, a 1920s niblick. It was with that club that Elliott aced the Punchbowl, The Cradle’s third hole. Playing by himself, Elliott lined the throwaway off the steep hill behind the pin, and watched from the tee as the ball began its rolling descent. By the time he reached the green, Elliott didn’t see a ball. “I knew it had to be in the hole,” he says. Elliott asked the group in front of him to walk with him to the cup to verify the hole-in-one. A shiver went through him. Ray Elliott takes a practice swing with his father’s niblick on the 3rd hole of The Cradle. 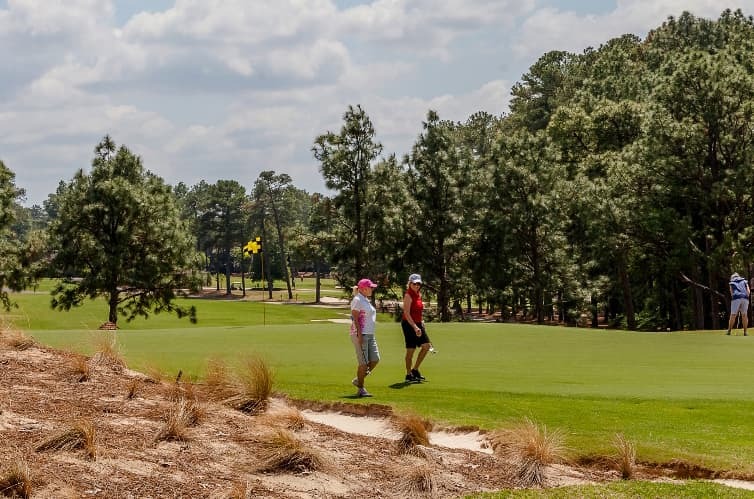 Since The Cradle opened, a debate has simmered along its sandscape and waving wiregrass: Is a hole-in-one on a short course equivalent to an ace on a regular golf course? Elliott now has four holes-in-one. But, to that question, with eyes still wet, he is firm with his answer.